Leyland based, Independent bus company, John Fishwick and Sons is to cease operating from today, Saturday 24th October 2015. The public transport company with a history extending from 1907 will no longer be providing a bus service for the immediate future and Stagecoach have stepped in under special measures to continue a bus service due to special dispensation. 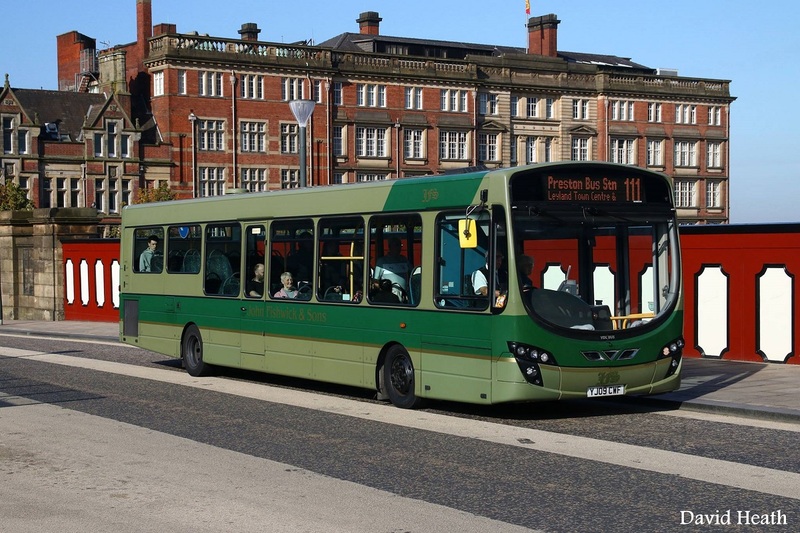 People from Preston, Leyland and Chorley will be lamenting the demise of the ubiquitous bus service which has become a way of life for local commuters. Many Prestonians will recall the Fishwick & Sons bus station at the lower end of Fox Street with the all too familiar green buses. Up to 1953 Fishwick & Sons also had a haulage side to the business as well as public transport. ‘Following the news that John Fishwick & Sons bus company is due to cease trading after business on Saturday 24th October 2015, Stagecoach can announce that they will be providing service 111 with effect from Sunday 25th October. This follows special dispensation given by the Traffic Commissioner to Stagecoach to allow this to happen at very short notice. The route will be the same between Preston Bus Station and Moss Side (old Black Bull), then will operate a loop of Dunkirk Lane, Schleswig Way, Longmeanygate, Leyland Lane, Dunkirk Lane, then normal route back to Preston. As a result, we will not be serving Golden Hill Lane between the Leyland Lane traffic lights and Tuer Street. There will be a new timetable, offering a 12 minute frequency Mon-Sat daytimes and every 30 mins in the evenings and all day on Sundays. We will accept all valid Fishwick’s tickets and passes for travel in the short term and will advise more on tickets in due course. The full range of Stagecoach tickets will be valid for travel. Service 111 will be within the Preston ticket zone, which covers all of Leyland area. We will not be in a position to operate any other former Fishwick’s routes on Sunday or Monday, but will be in discussions with Lancashire County Council over the possibility of covering other sections of route’.